About Quality Tree Care, Inc.
For meticulous tree pruning, stump removal, and related tree services, trust only Quality Tree Care, Inc. in Alexandria, Virginia. As certified arborists for more than 20 years, we have gained the trust of many clients through our fair estimates and excellent quality of work. 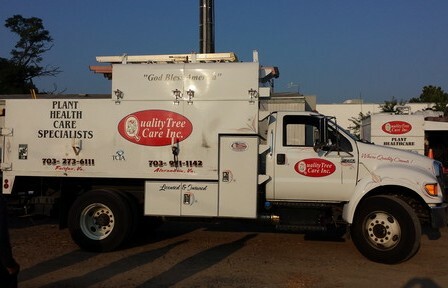 True to our name, Quality Tree Care, we uphold the highest standards of tree and plant health care in the industry. Quality Tree Care, Inc. has been serving the arboriculture needs of Northern Virginia and the surrounding areas since 1994. We are a family-owned-and-operated business, and our professionally trained arborists and technicians are dedicated to upholding the highest standards of work. We pride ourselves on being specialists of the trees and shrubs in Virginia. Focusing on providing care for your trees and shrubs, we have spent over three decades of accumulated experience and knowledge in this area of service. It has become our job to eliminate the stress and worry you may have associated with properly maintaining your trees. We bring you our high level of expertise, as well as first-rate customer service. At present, we have two ISA-certified arborists, as well as three trained and certified pesticide applicators of the Virginia Department of Consumer Services. Our professionally trained crew is the best in the business, as they go beyond expectations to ensure the job site is always safe. They also constantly attend safety training as well as ISA seminars and classes. Contact us in Alexandria, Virginia, to seek the assistance of highly skilled and certified arborists that care for your trees and shrubs.